I’ve been reading the book, Mass Culture: Eucharist and Mission in a post-modern world (edited by Peter Ward) for a few weeks now. I’m still only halfway through and the bottom corners are going to be pretty stuffed by the end of it. (Top corner fold for marks my place, bottom corner for marking something interesting like a quote). The book is a collection of ‘article’/chapters around the themes of Communion and Mission and Postmodernism (oddly enough) and how they interrelate, written by a variety of leaders from a variety of denominations. It’s facinating, pretty pleasing and enlightening stuff. A couple of the points I’ve picked out so far (pretty much from one particular chapter) as worth exploring more or just simply interesting (here’s where I flick to the first lower corner fold and try find on the page what I found interesting)…. “Another element of post-modernism invites its audience to ‘enjoy the surface’ of life’s experiences because there is nothing beneath the surface. In other words, nothing is sacramental, nothing points beyond itself to anything else. Each experience is what it is or does ot you, there is nothing beyond. 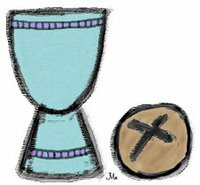 From this perspective the eucharist may give a sense of awe or of ancient community, but it can never be more than a sense, a vibe. Any such experience is understood as a feeling to be fleetingly enjoyed, it could never be more. So from this perspective, while the eucharist gives you a buzz, go for it. When it doesn’t and the ‘been there, done that, so this place as no more ot offer’ feeling comes over you, then move on to something stranger…. “There is the danger that post-modern people seek experience for its own sake, that they become not more then sensation gatherers, but an experienceless Christianity is not New Testament Christianity and will never commend the faith. Churchmaship may high or low; the worship may be liturgical or more spontaneous, the focus may be on the word or the Spirit, but there is no substitute for encountering the presence of the living God. I think it’s probably been most interesting looking at the influences of post-modernity in my own life and how I treat different situations that arise, how I respond to things, what I go out of my way to do or ‘experience’. It’s fairly confronting in the way I often approach God. I do hope I’ve moved a bit beyond the ‘live for the experiences’ (sadly that in a way, that is or used to how I treat some of life). We can’t do the immature dismissal of God by believing our doubts when we cannot see him working, when we cannot hear him, cannot ‘find’ him. God exists despite our experiences or conceptions. But oh, it’s easy to get frustrated! There is a great beauty and life in encountering our maker. It’s a richer and fuller comprehension of something if we can feel ‘part of it’, but the experience does not mean it ceases to exist after that point or didn’t exist before we got there. I am pleased that communion is something I get to participate in, to ‘experience’ and to meet God in. I love it that we’ve made an effort in young adults to do this together. To be really comfortable in my postmodernism, I have no problem saying that there is definitely something about those moments, there usually is! But we shouldn’t take up the position of not ‘having communion’ – just because we don’t feel like it, or feel it. And there I’ll cease forcing my scattered thoughts on to you. Well done if you’ve read this far. Anyone care to borrow the book? Sounds like a very interesting book Bec. Where did you get it?